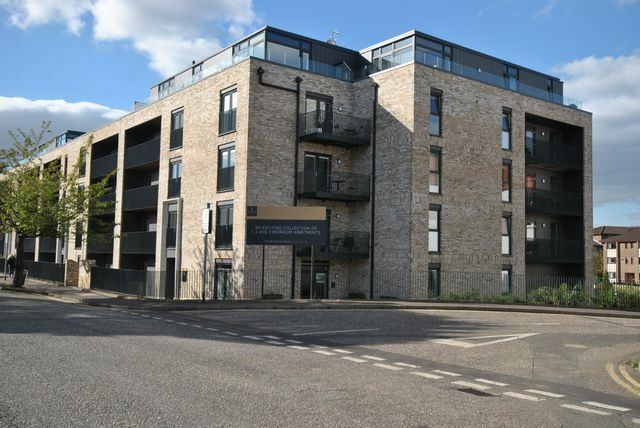 This new beautiful and well-appointed 2 bedroom UNFURNISHED Penthouse apartment(PLOT 34) with large private balcony, is located in the exclusive Cala development, close to the city centre and within a 10 minute walk to the top of George Street where you will find, amongst others, Harvey Nichols. Edinburgh's fine eateries and bars are also close by and the renowned Edinburgh Playhouse is even closer. The property is accessed through a secure entry, with lift access to the 4th floor. There is a private parking space directly outside the main door, along with a secure bike shed, which is a secure room located off the front entrance foyer. Furthermore there are well maintained communal grounds. The property consists of a large open plan living room kitchen; with an excellent finish and with roof top views across the city, this room is quite exceptional. The living room has wrap around windows with a large private balcony and the views extend over to Carlton Hill and towards Arthur Seat. From the kitchen the views over to Fife are just as impressive. The living room benefits from Amtico flooring and is painted white throughout. Furthermore, tv(sat), phone line, radio can all be accessed through one panel, neatly installed on the back wall. The kitchen has a selection of sleek kitchen units and built in appliances, including fridge freezer, dishwasher, double oven, microwave. There is also a washer dryer, that is located separately from the kitchen in a utility cupboard. The room is well designed for full use of modern day living. There are 2 bedrooms, with master en suite. The master bedroom has direct access onto the private balcony and further benefits from a very large built in double wardrobe, and tv point along with those wonderful views. There is a beautiful en suite with double shower cubicle and plenty of space. The second bedroom also has built in wardrobes. Both rooms continue the contemporary décor theme, with white walls and grey amtico flooring. The family bathroom finishes the rooms in this apartment and does not disappoint in terms of space or finish with a 3 piece suite and shower over bath. There are 2 very good size hall cupboards. Secure door access, lift access, GCH and private parking.